Thousands of years old, cuneiform tablets are still getting some buzz! A CBC Radio story profiles researchers who are working to reveal the hidden stories in cuneiform tablets: "Machine Learning Deciphers the World's Oldest Texts" (15 Dec 2018). A story in University of Alberta's student newspaper, The Gateway (Feb 2019), profiles the small collection of cuneiform tablets housed in Bruce Peel Special Collections: "Four 4,000-year-old Tablets Make Up the Oldest Item[s] in the U of A's Library Collection." 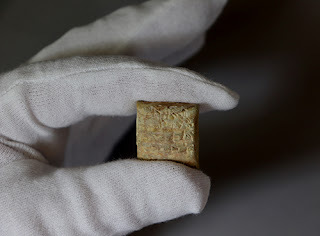 An international story in The Guardian (10 Mar 2019), reveals the value of one very special cuneiform tablet: "Babylonian Treasure Seized at Heathrow to be Returned to Iraq: Stone Dating from Second Millennium BC was Claimed to be ‘for home decoration’." Bruce Peel Special Collections is located in the basement of Rutherford South and is open Monday-Friday 12:00-4:30pm. Visitors are welcome to drop in to check out the current exhibition. Researchers are welcome to examine rare materials in the supervised reading room, but are asked to request those materials in advance of their visit using the library catalogue or a Retrieval Request Form.